Ferrara answered questions about his book via email. 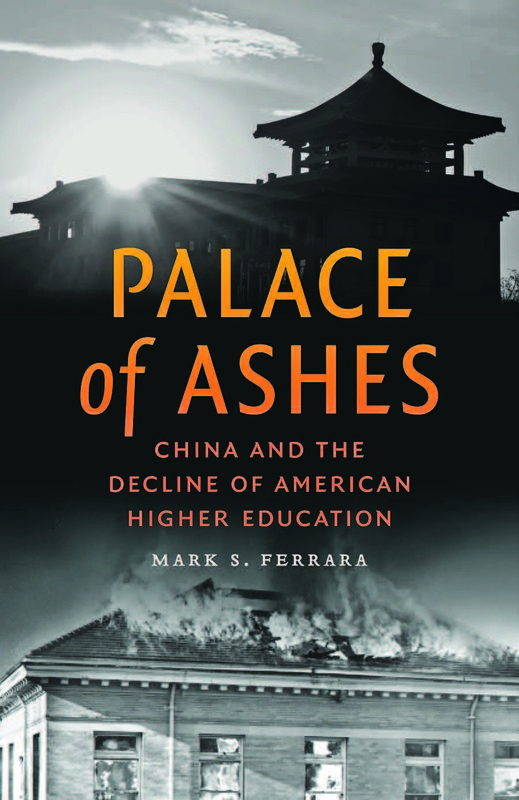 Q: In Palace of Ashes, you juxtapose the massive investments the Chinese government has made in the country’s universities over the last 35 years with corresponding declines in public support for higher education in the U.S. Why is this, as you title one chapter, “the Chinese moment”? A: Globally, we are entering a period of economic convergence in which emerging nations such as China are rapidly catching up with rich countries -- to the extent that they attain the same technological skills and education levels as leading nations. Since the diffusion of knowledge is a driving force behind convergence, when emergent nations make substantial and enduring investments in higher education, they stand to claim a larger share of the global production of goods and services -- and thereby narrow gaps in living standards with advanced economies. More broadly, China’s sustained effort to elevate its top universities toward world-class standing reflects China’s growing global ambition. For instance, the country is modernizing its military and extending its territorial claims. Q: At the same time you describe a “crisis” in American higher education. What are the main reasons for this crisis? A: The reasons for crisis in the American academy are complex and manifold, and may only be outlined in broad strokes here. Since the 1980s, a majority of faculty members across the nation have been made into part-time contingent employees who teach on a semester-to-semester basis for $20,000 per year on average (often without benefits). Yet, while more than half the American professoriate wallow in the wastelands of contingency, the average annual salary of university and college presidents, who relegated those faculty members to subordinate positions, reached nearly $290,000 (plus perks) during the 2014-15 academic year. In recent decades, these “captains of erudition” also bloated the executive, administrative and managerial ranks, which accounts in large part for high tuition and fees in the United States. Furthermore, as income increasingly determines access to tertiary education, it worsens income inequality and weakens national competitiveness during a period of economic convergence (which favors emerging nations such as China). Other causes for the current crisis in the American academy include: student loan debt now exceeding a trillion dollars, the adoption of corporate governance models, the rise of an audit culture that props up the new managerialism, increasing standardization and vocationalization in the curriculum, the diminution of the humanities, and the forfeiture of the ideal of higher education as a public good. Q: You tell a story about Chinese higher education on the rise and American higher education on the decline. But what are the main challenges that continue to hold Chinese higher education back on the global stage? A: China has made enormous strides in higher education since the late 1970s, but the current dominance of science and technology in the curriculum has resulted in the eclipse of humanism (a Confucian tradition) at a time when the country needs more creative and innovative thinkers as it transitions from a manufacturing to knowledge economy. A pedagogical emphasis on memorization endures, and it leads to a privileging of rote learning over the creative synthesis of knowledge. Moreover, despite reform and expansion, competitiveness among Chinese high school students for access to the nation’s leading national and regional institutions of higher learning remains intense. Many of those who do not gain entry choose to go abroad to study, contributing to brain drain -- and Chinese graduate programs remain ill defined as to whether they train researchers or professionals. For these reasons, China increasingly looks to the West for higher education reform, but it cannot simply buy or manufacture a culture of institutional autonomy, shared governance, meaningful tenure protections, free inquiry, administrative transparency and a lack of censorship that were hallmarks of American higher education (during its apex between 1945 and 1980). Nevertheless, to the extent that Chinese colleges and universities emulate those positive features of American higher education, institutions of higher learning in the United States will gain more rivals for the best faculty and students that the world has to offer. Q: You write that “most American colleges and universities are ill prepared to compete in our age of global rivalry in the higher education sector,” while noting that some readers might find your claims about the decline of American higher education to be alarmist. What would you say to such readers? A: While the United States still possesses a handful of universities that lead world measures of excellence (such as research spending, patents, number of international students and invention), a decline in the overall quality and stature of its institutions of higher learning took place over the last three decades. Attaining a higher education in the United States now costs significantly more than in other rich nations, yet despite increasingly high tuition and fees, our students have just a 23 percent chance of having a full-time tenurable professor teaching their classes. Such a situation begs the question, why are students paying for ballooning administrative salaries instead of a noncontingent professoriate? In my view, students (and their parents) do well to demand more streamlined campus administrations, insist on tenurable faculty members to teach the clear majority of courses and require state governments to reinvest in public higher education as their coffers refill following the economic travails of the great recession of 2008. Q: Your overarching argument is that “if the status quo is maintained, American colleges and universities will gradually squander their global pre-eminence as faculty publication rates slow, public fiscal support for higher education dwindles and the ranks of the tenured professorship decline precipitously.” Are the issues you raise different for public and private universities, elite and nonelite ones? A: While the billion-dollar endowments of some elite institutions may help to insulate them from the worse symptoms of decline, neoliberalism (a universalized logic of competition that justifies the transformation of institutions established for the public good, such as universities and hospitals, into business enterprises) is depleting the American academy of its intellectual capital. It is creeping through public and private, elite and nonelite institutions alike. Whereas American colleges and universities of the past eschewed ties to business and profit (as corrupting influences on pure disinterested research and the ideal of liberal learning), the current rush to transfer academic research to the needs of the marketplace, as quickly and profitably as possible, is very much in keeping with neoliberal doctrine -- as is passing of the costs of college on to the “consumer” through higher tuition and fees. In addition to possessing the world’s largest economies, China and the United States have extensive higher education systems comparable in size. By juxtaposing their long and distinctive educational traditions, Palace of Ashes offers compelling evidence that American colleges and universities are quickly falling behind in measures such as scholarly output and the granting of doctoral degrees in STEM fields. China, in contrast, has massed formidable economic power in support of its universities in an attempt to create the best educational system in the world. Palace of Ashes argues that the overall quality of U.S. institutions of higher learning has declined over the last three decades. Mark S. Ferrara places that decline in a broad historical context to illustrate how the forces of globalization are helping rapidly developing Asian nations—particularly China—transform their major universities into serious contenders for the world’s students, faculty, and resources. Mark S. Ferrara is an associate professor of English at the State University of New York. He is the author of Barack Obama and the Rhetoric of Hope and the coeditor of Between Noble and Humble: Cao Xueqin and the Dream of the Red Chamber.